Here are just a few of the workshops I have offered in previous years. My workshop programme for 2018 looks even more exciting! 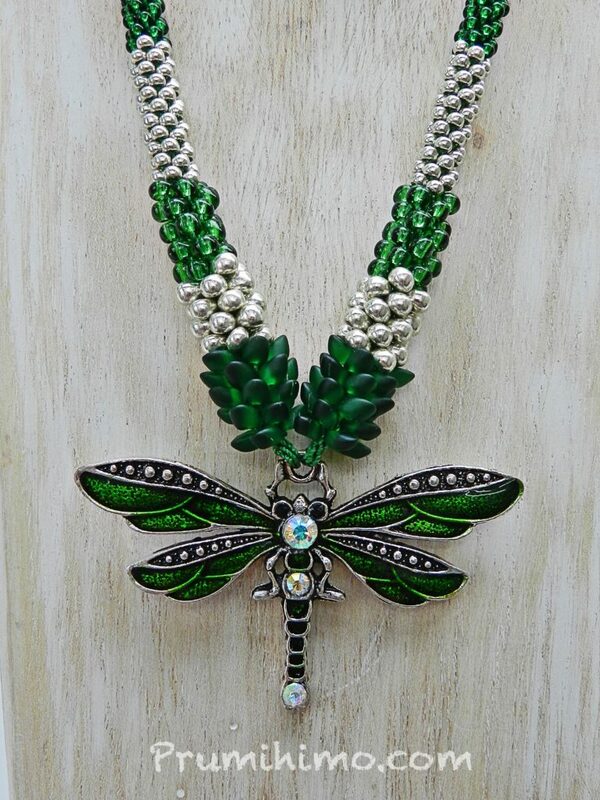 I currently have plans to teach in 3 UK beadshops and also at the Big Bead Show, but I have been invited to teach in several other locations and I am considering the possibility. This is the programme for 2018, please scroll down for the details. This will be my fourth year of teaching at Spoilt Rotten Beads in the pretty village of Haddenham, Cambridgeshire and I have lined up some lovely projects to teach. In this blog I would like to talk about how I choose the design and what I hope to achieve in the workshop. My aim is always to teach more than just the advertised design. I choose a design which includes transferable skills which students can adapt for their own creations and I also bring lots of samples of variations, so that I can discuss and illustrate how a design can be developed and customised. The first workshop is on Saturday, 17th March and I will be teaching this double bracelet made with clusters of Long Magatama beads. This is a striking, yet delicate design, with a clever construction and fastening. 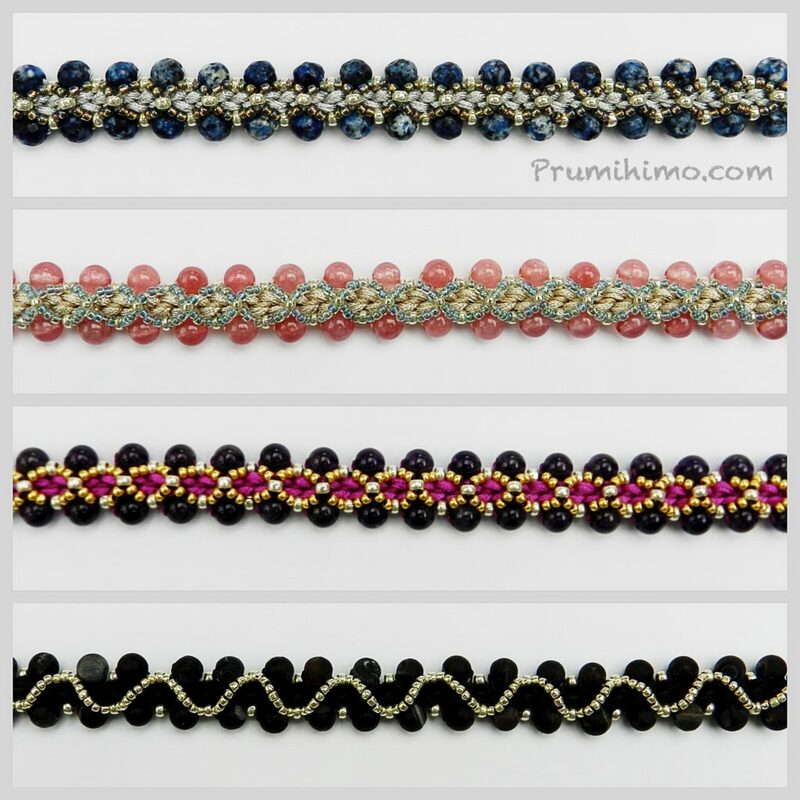 The braid structure is Round Braid (Kongo Gumi), which means that this workshop will be suitable for beginners, but the way in which the beaded clusters are formed will enable me to teach how to create a variety of effects with Long Magatamas, which will be of interest to more experienced braiders. The fastening is a really useful technique, which can be used in many different ways. I have chosen a design which is not fulled beaded because threading beads can be very time consuming and I want to be able to use the time in the workshop as effectively as possible. Everyone works at their own pace so I have chosen a piece which the faster braiders will be able to finish in class, but those who work more slowly will be ble to complete the main aspects of the design during the day and will be able to finish off at home. I always provide detailed handouts to support participants after the class. The second workshop is a masterclass on how to finish off your kumihimo and it will take place on Saturday, 21st July. Dealing with the ends of a kumihimo braid is something everyone finds difficult, which is a shame because there are lots of creative ways of doing this. The examples in the photo are just a few of the possible ways to turn a braid into a functioning piece of jewellery. My aim in this workshop is to teach my favourite methods and I am asking participants to bring unfinished pieces to work on. I will be able to help them to choose just the right method for their own work. The methods will include wire cones, spirals, beading, buttons and more. Whether you are a beginner or an experienced braider, this workshop will give you the skills and confidence to create the perfect ending every time. A really useful handout will be provided for future reference. The final workshop of the year is still a bit of a mystery! It will be a Christmas decoration workshop and over the last 3 years these have proved to be very popular. You can really never have too many decorations on your tree! For this year I am proposing an icicle decoration. The photo shows designs from previous years, because I am still working on the precise details of the project, but I can assure you that it will look great on your Christmas tree and like the other designs I am sure you will want to make many more at home. Of course, you will be given a great handout so you will be able to make as many as you like, year after year. The date is Saturday 24th November. The skills involved in making a decoration can easily be used in jewellery making, so this workshop is for life, not just for Christmas! The first kumihimo workshop I taught was at Stitchncraft in Dorset, so I always enjoy returning to this beautiful shop with its comfortable and well appointed workshop room. As a tutor it is wonderful to be invited to return to teach, year after year, but it does require careful thought for the proposed projects. I am lucky enough to have a very loyal following of students who had attended many of my workshops, including one lovely lady who has been to every single one of my workshops at Stitchncraft. On the other hand there are always a few newcomers to the workshop. My workshops need to offer something new to develop the skills of the regulars, while being achievable for beginners. 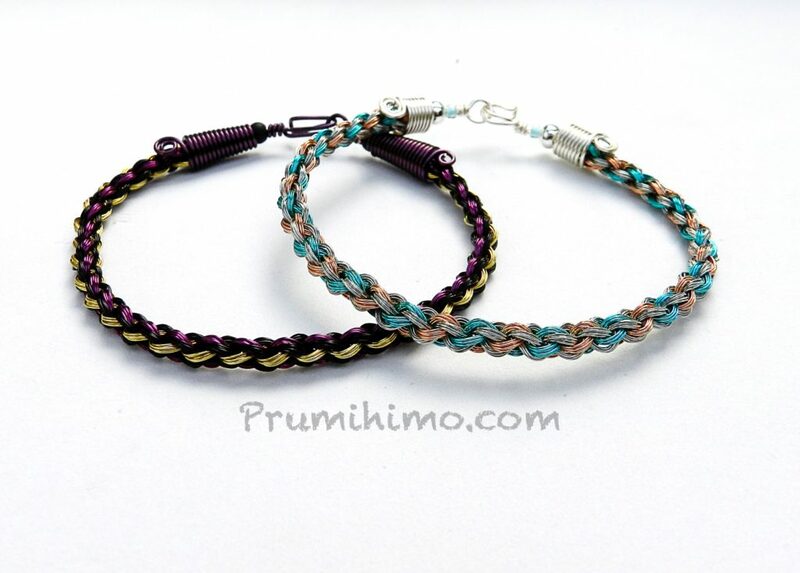 The first workshop is on Thursday 10th May and it is Kumihimo Braided Pendants. I am asking students to bring along a favourite pendant, so that the braid can be constructed from the pendant. There are several ways of attaching the pendant and I will ensure that each person uses the best method for their own pendant. The braid structure for this design is Round Braid/Kongo Gumi, so it is suitable for a beginner. The development skills in this workshop include learning how to graduate width of a beaded braid, planning the composition of a design and how to make an alternative ending and fastening to a braid. The second workshop of the year is on Thursday 5th July and it is called Granny’s Button Box. Buttons are a lovely way to add character to a design, as well as being a great way to make the fastening. 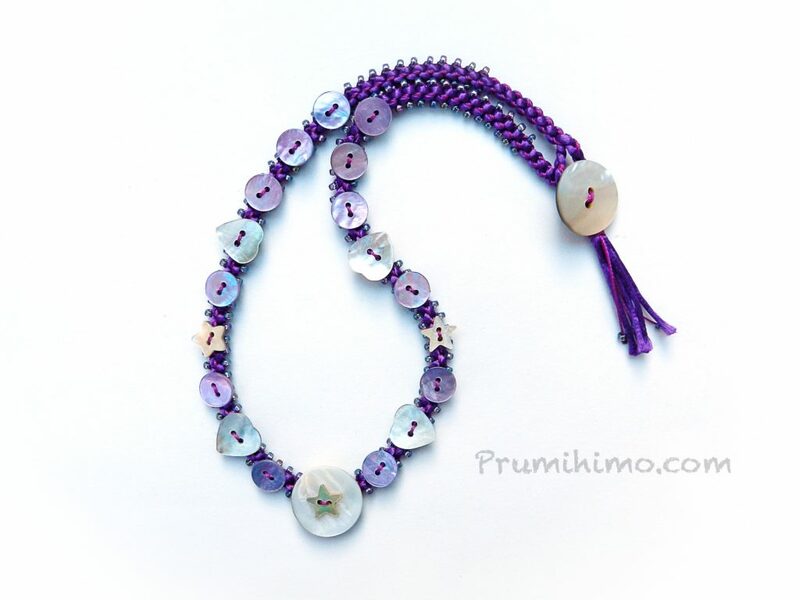 For this workshop the Prumihimo disk will be used because produces straight, not spiral braids which allow the buttons to be positioned in a straight row. This means that the workshop is suitable for those who have prior experience of the regular round disk. I am asking students to bring along their own buttons, so the final designs will be very individual. Some people may choose to bring a neat row of identical buttons, while others will bring an eclectic mix of old favourites. 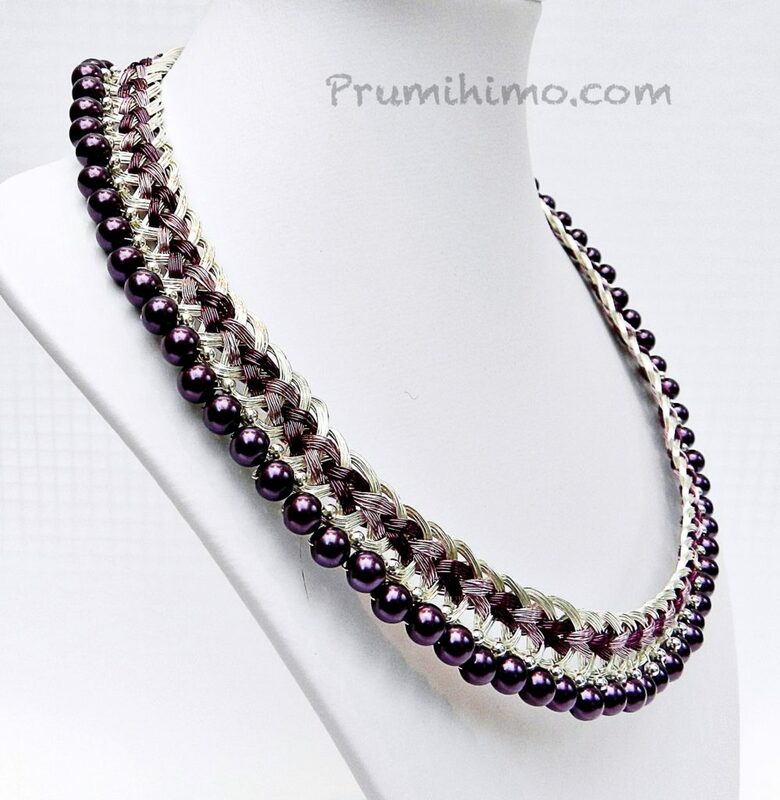 I will teach how to plan the design to achieve the correct spacing between the beads. The design is finished off with a matching button fastening. This fastening is a very useful technique which can be used on lots of other designs, so it is a very valuable addition to your braiding skills. 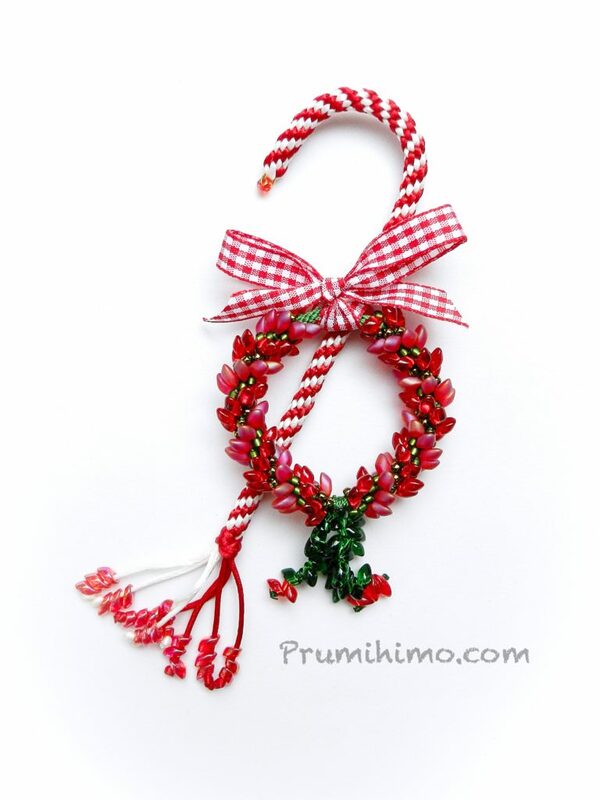 The final workshop of the year at Stitchncraft is on Thursday 1st November is Kumihimo Christmas Decoration. This wreath decoration is sure to look amazing on any Christmas tree and I am confident that students at this workshop will want to make many more at home. The braid structure is Round Braid/Kongo Gumi, so the workshop is suitable for beginners. The decoration may be small, but it is made using some really useful transferable skills. I will teach students how to braid around a core, reverse the direction of the spiral, make a curly tassel, make a 4-colour spiral and work directional beads. In addition I will be teaching how to make the candy cane decoration. For all the workshops I provide a great handout, so that the designs can be finished off at home if necessary or so that further designs can be made. I always bring lots of samples to the workshop so that I can illustrate how the design can be varied or adapted. My aim is to inspire students to use the skills learnt in the workshop to develop their own designs. I am very excited to be bringing a wire kumihimo workshop to Riverside Beads in Lincolnshire on Saturday 9th June. Wire is a popular medium for kumihimo and there are many different ways of using wire effectively in braiding. I have been working with wire for over 6 years and my favourite approach is the muti-strand method. In this workshop I will pass on my secrets for success with this particular way of working with wire. Wire can be tricky to work with unless it is handled in the correct way and kumihimo has its own particular challenges, so I will be able to share what I have learnt over the years. 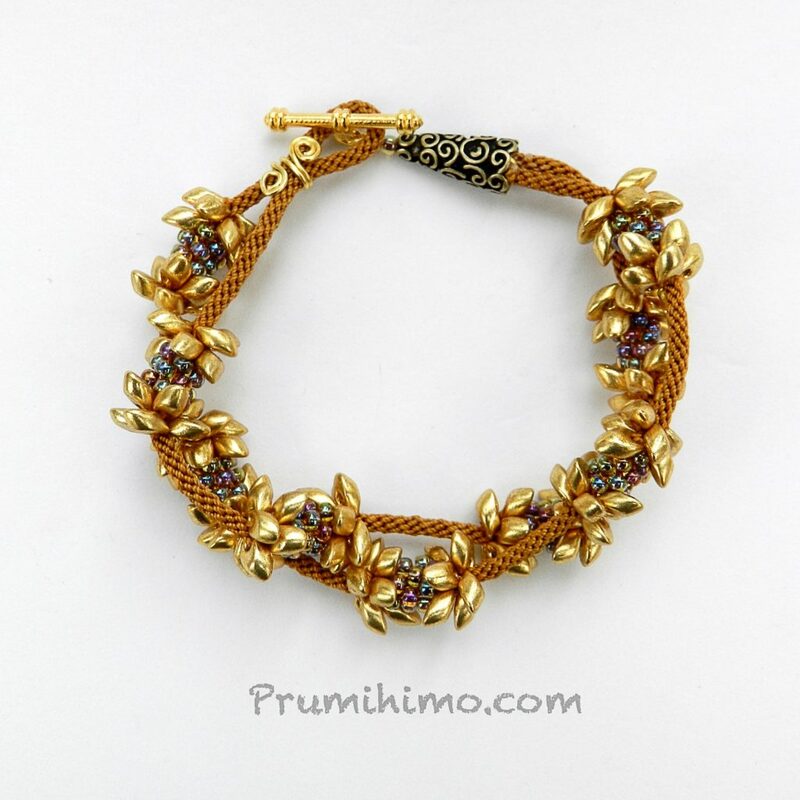 The class project will be this striking wire kumihimo bracelet, made on the Prumihimo disk and finished with wire cones and clasps. This bracelet feels wonderful when worn because it has a great weight and hangs well on the wrist. Students will learn what sort of wire works best, how to handle it, how to braid with multiple strands and how to finish off the braid securely. Finishing a braid into a piece of jewellery is as important as the braiding itself, so I will be teaching a great way to create neat ends and a lovely clasp. 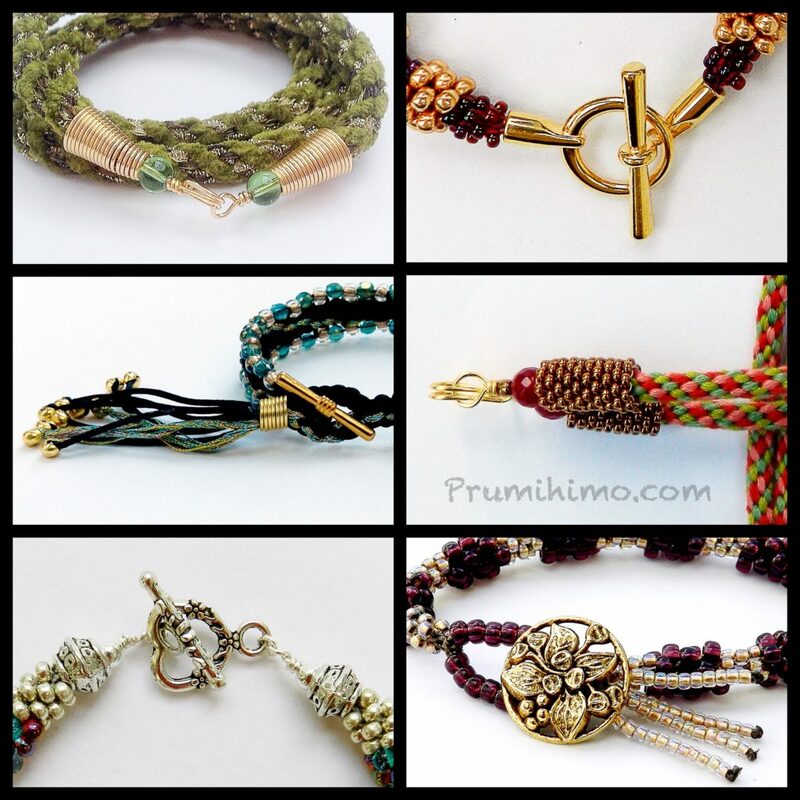 This method can also be used for cord kumihimo, so it is a great skill to learn and be able to use for other designs. As usual, my aim is to teach far more than just the class project and to give students the confidence to develop their skills on their own. Once the basics have been mastered it is possible to create a huge variety of effects with this wire method, including working with beads and with different braid structures. One of my first successes with wire was this necklace, which was a finalist in the Jewellery Maker of the Year competition in 2011. A necklace like this requires very long lengths of wire and takes a bit of time to complete, so it is not suitable for a workshop. However, once the key elements of braiding with multiple strands of wire has been mastered this is the sort of design which could be achieved. 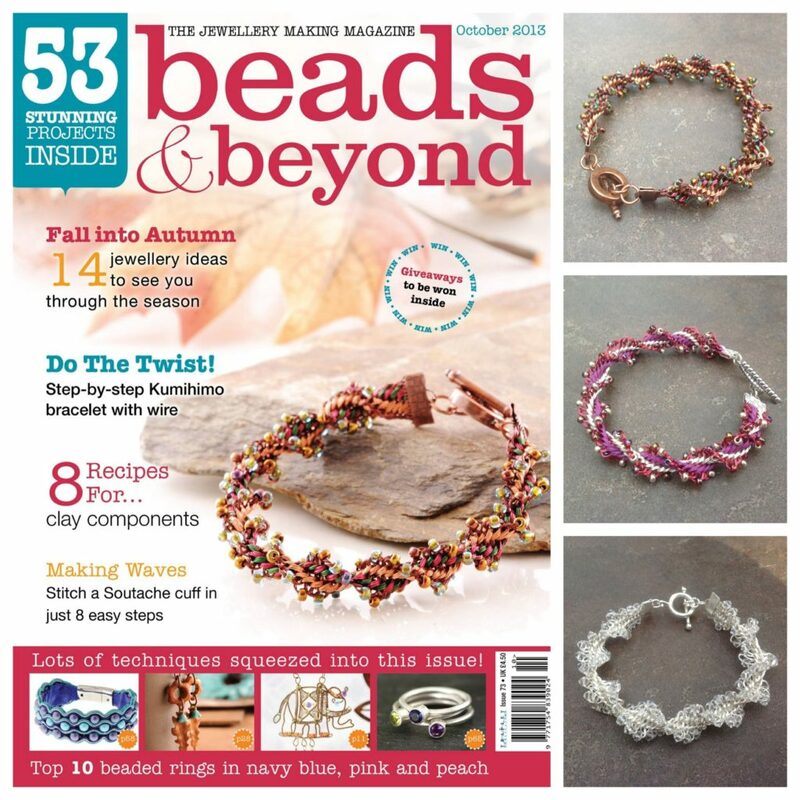 In 2013 a tutorial for one of my wire designs was published by Beads & Beyond magazine and even made it onto the front cover! This type of design could also be made once the multiple wire braiding method has been learnt. It is all a matter of learning a new braid structure and applying what has been learnt in the workshop. Riverside Beads is located in the charming town of Market Deeping in Northamptonshire. Riverside Beads is a very well-stocked beadshop. The owner, Donna McKean-Smith, is a keen braider whose work is often seen in magazines as well as her excellent book, Bead-Braid-Twist, so you can be sure that braiders are very well catered for! The workshop is spacious and comfortable, with plenty of tea and coffee all day. The workshop is great value because all the materials will be provided and included in the price. Over the past four years I have taught at workshops in five different locations and I currently have workshops planned for 4 of them for this year. I have often been invited to teach in other places, but I have declined the offers because I have not felt they were quite right for me However, a new invitation came my way this year and I felt that it would be a good addition to my current programme of workshops. Charming Beads in Monmouth will be hosting a brand new workshop from me on Saturday 28th April. The reason I have accepted is that the set up will be a little different to elsewhere. Charming Beads have created a brand new workshop space for this year, complete with TV screen streaming for close-up detail. I think this will be particularly useful for some aspects of kumihimo, such as the positioning of beads in a braid and attaching the clasp. There will be a dedicated workshop co-ordinator, fellow kumihimo enthusiast Helen O’Connor, who will be making sure everything runs smoothly, as well as providing us all with a delicious buffet lunch, teas and coffees and even cake! I think this will make the day particularly sociable and friendly and the opportunity to connect with other braiders is a very important part of attending a workshop. The materials and equipment needed for the workshop will be provided and are included in the price, so there are no hidden extras and you know you will have exactly what you need. There will be a choice of colours and gemstones on the day. 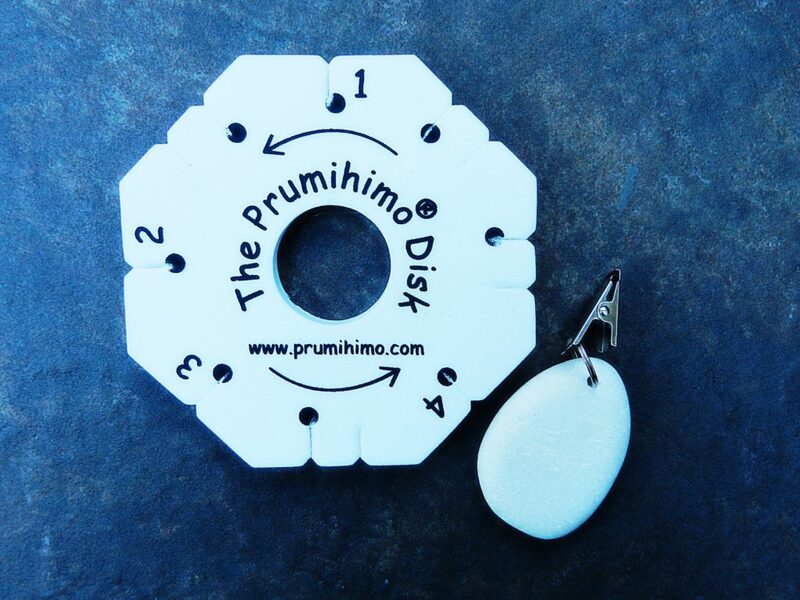 You will be provided with your own Prumihimo disk and 50g weight not only to use in the workshop, but also to take home with you, because I am really keen that you should be able to continue the Prumihimo journey when you get home. The day will finish with the opportunity to shop. 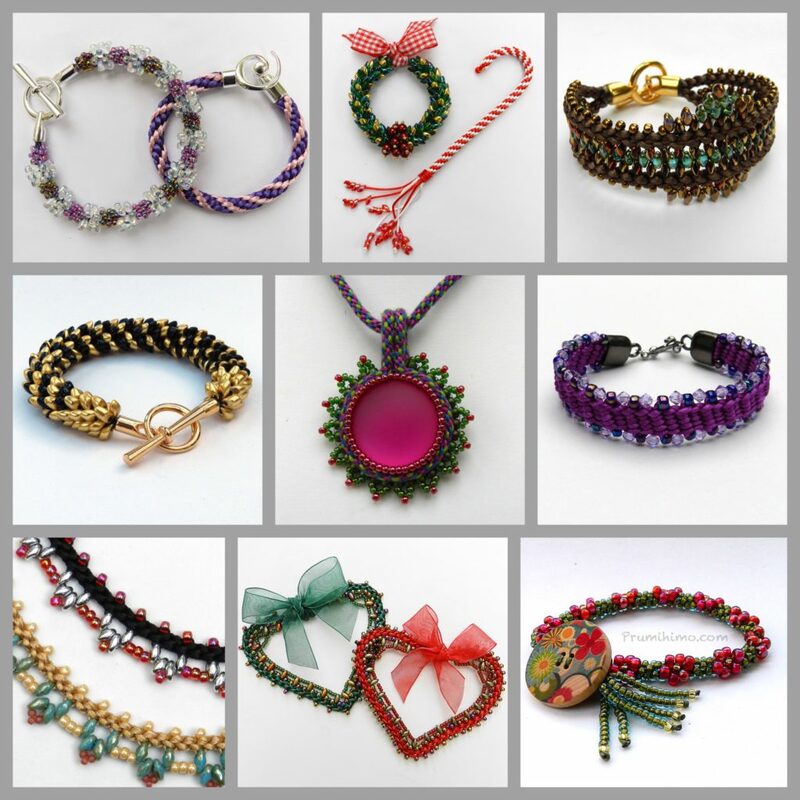 Charming Beads is an on-line shop, so this is a rare chance to be able to see before you buy. This is so valuable when it comes to all the fabulous gemstones they stock, because each and every bead has its own character, which can only be fully appreciated when you are able to see them in real life. Charming Beads also stock a great range of clasps, end caps and other findings which are the key to a good kumihimo stash. 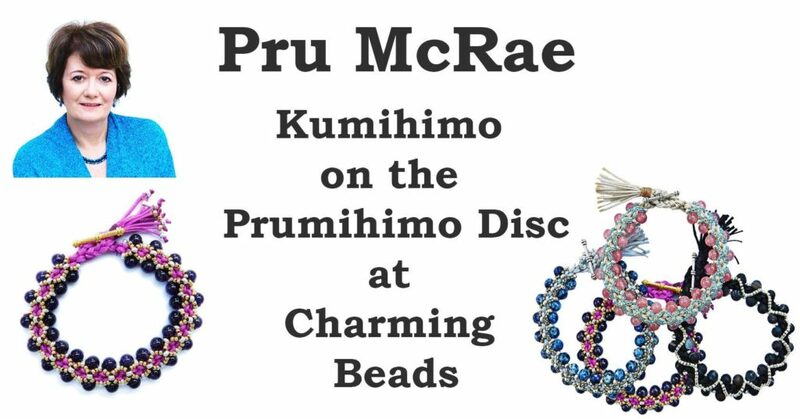 I will be on hand to advise on how different beads and findings can be used in kumihimo, as well as how you can build a really useful collection of components, beads and cords. Of course the surroundings, the hospitality, the facilities and the shopping are only part of the story. The design I have created especially for this workshop features some of the lovely gemstones Charming Beads are known for. 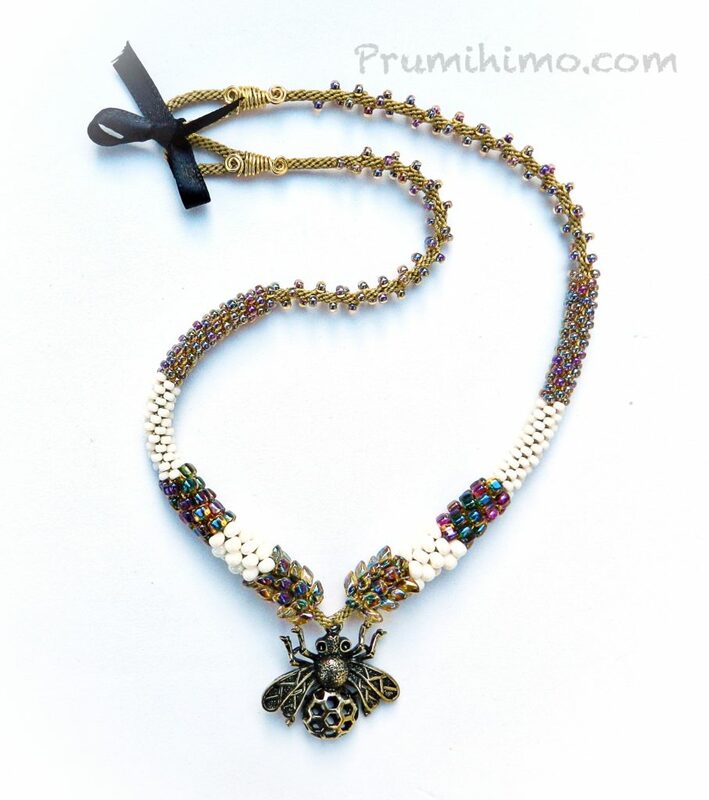 The Prumihimo disk is the perfect tool to combine traditional braiding with beads of all different shapes and sizes, so in this workshop I will teach how to braid with both smaller and larger beads. Then participants will learn how to embellish a braid with beadwork before finishing off with one of my signature kumihimo fastenings. This workshop will open up a whole new world of kumihimo braiding to those who have already tried basic braiding, but it is also suitable for complete beginners because I will teach each skill in detail and build your knowledge and confidence gradually throughout the day.